By Paying You Agree to Terms. Payment arrangements are for any style but must be paid in full the appointment day. Pay online or in person. Please be sure to keep all print out or electronic receipts and bring them with you to your appointments. Deposits are $40.-$50. Deposits may be required for any style; especially for styles over $80.00. If you are known for canceling appointments or no shows a deposit will be required. 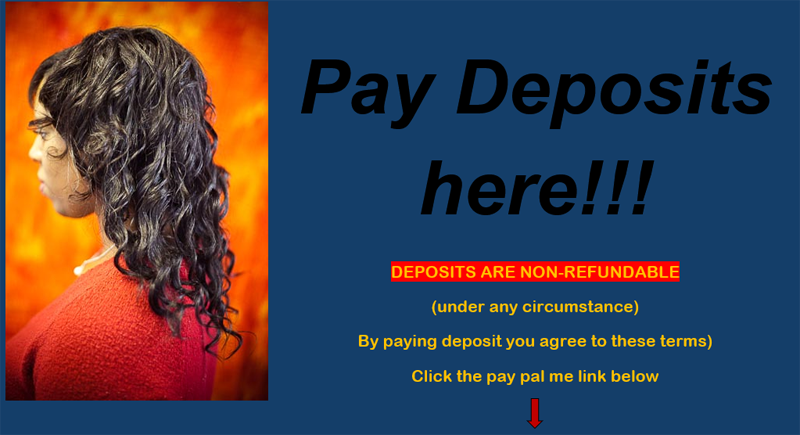 A Deposit is NON-REFUNDABLE and will hold your appointment. The deposit amount will be deducted from the final price. WITHOUT THE DEPOSIT YOUR APPOINTMENT IS NOT GUARANTEED. Your balance is due at the time of your appointment. If you miss this appointment you will have to reschedule with another deposit. For your convenience, I do accept credit and debit cards via PayPal /Square in the salon. Please be sure to keep all receipts; I am not responsible if they are lost. YOU WILL NEED THE HAIR FOR YOUR STYLE!!!! Please note that I may or may not have hair for you. If using my hair there is an extra fee for the hair. I can however also purchase/order hair at your request and with a deposit or full amount for your hair that you will need. You are responsible for providing hair. I do not guarantee the quality of ANY HAIR, and take no responsibility for bad hair. All prices are subject to change with or without notice. Again, ALL PRICES ARE ESTIMATE PRICES and can change at any time during your service. Prices may vary from stylist to stylist. A stylist that is more educated in a service than another stylist may have slight pricing differences.